Here's another beginner's guide from publisher 3DTotal. I've reviewed the earlier one Beginner's Guide to Digital Painting in Photoshop also and the presentation format is similar with this book. The plastic slipcase cover is gone and the book's also less expensive. Nice. The content's split into four parts. In the first section, there's Rich Tilbury introducing the interface and painting tools available for Photoshop Elements. It's for the beginners so it assumes no prior knowledge with the software. If you're new, you'll get up to speed quickly. The software version used in the book is Photoshop Elements 12 and at the time of this writing, version 13 is already out (and cheaper). Anyway, the interface should look more or less the same. The next section there's Christopher Peters who talks about the basic techniques in art theory. He covers light and colour, composition, perspective and depth and other subjects. It's a very informative section that has steps that you can follow along. Again, the content is written in a simple and easy to gasp manner for beginners with no art knowledge. The third section has several full length tutorials from contributing artists. The tutorials look at various art styles, such as landscapes, stylised illustration, speed-painting, working with traditional sketches or photos, cartoons, etc. You can easily follow along to learn the techniques and get yourself familiar with the painting tools used. It's helpful in the sense that you'll know what's the correct tool to use when you think of certain effects you want to create. The next section has quick tips and steps to create common textures, such as clouds, water, rock, dirt, trees, rain, fire, smoke, hair, skin, and many more. It's very useful for beginners to get them started at creating their own textures. Takes a bit of guess work out but I like the quick tips. Last section has step by step screenshots of artworks by several artists. No captions provided here though. Great book overall. 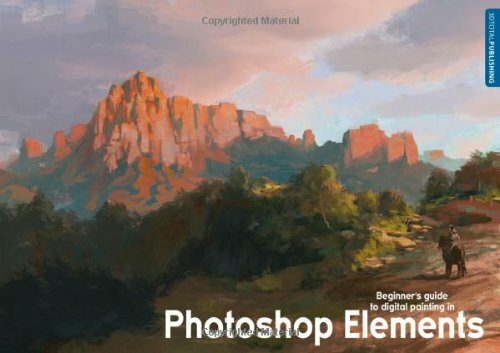 Recommended to beginners who wants to learn digital painting using Photoshop Elements.